This is what my kitchen really looks like on any given Friday night…. Baking for the fundraiser on the counter, liver bite dog treats for the furry children, a snake on the floor to keep me company, and children’s art work on the fridge… I truly have a “lived in & loved” kitchen. Don’t get me wrong, I know how messy this place looks, but our kitchen in the centre of our home. We bake, create and laugh with each other in this small messy space. During dinner parties, my girlfriends & I chat, giggle and drink red wine in my kitchen as we swat away the fruit flies and guess how long it will take before the kids find us. I love the natural wood cupboards and gas stove. What I lack, in my current kitchen, is a family eating area. A kid friendly eating area that gives the kids an opportunity to fill their bellies and at the same time tell me about their adventures at school, swimming and gymnastics. I would also change the floor to a more pleasant feeling and dog friendly flooring. I would rip out the white tile and grout that is on all the counter tops. As functional as the tile is, I cannot tell you how many times I have had to bleach the grout & scrub stains off of the white tiles. There would be one word to describe my dream kitchen…spacious. 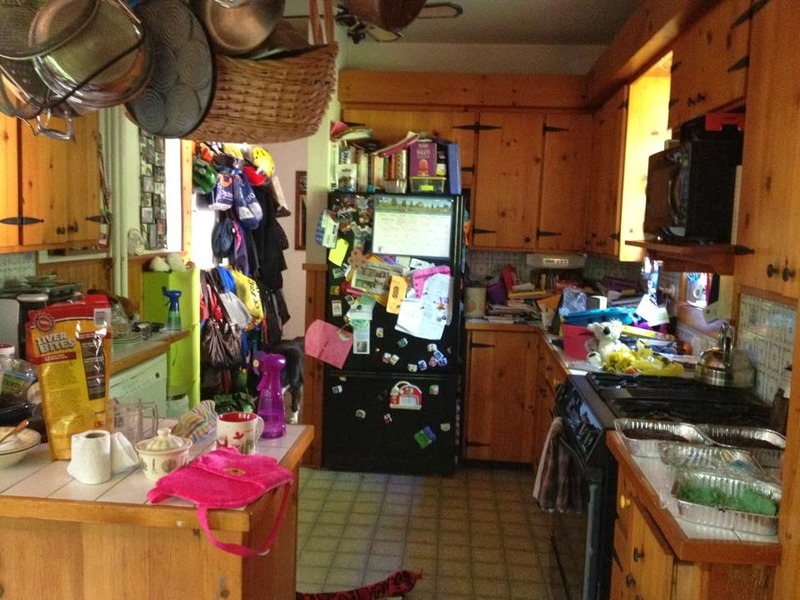 A large open counter space for the kids and I to bake special treats, cook our dinners and review homework assignments. A more spacious fridge in order to accommodate the the five, container filled, lunches I make each evening. Extra space in the oven for a 15 pound turkey, baked potatoes, dressing, curried carrots and an apple crisp for holiday dinners. A functional and fashionable breakfast nook would also need to be added to my dream kitchen to give the kids and I, a space to break bread together each morning. Mind you this breakfast nook could also double as a wine bar in the evenings, when we have a girls night in. I am also dreaming of space for the recycling bins, green bin and garden compost bin that are not visible to our guests and fruit fly free. Finally, for my dogs, a space for Snickers and Easton to call their own, including kitchen dog beds, food storage containers and toy bin. In the end my dream kitchen would have many of the same items as my current kitchen has, but just more organized, updated and uncluttered. In my everyday life this would make my daily chores less challenging and more enjoyable. I think that my family and I would use my dream kitchen as more of a meeting area instead of the dumping ground my current kitchen has evolved into. Do you need a new kitchen? Finish®, in partnership with Bosch®, is looking to make this a reality for 10 lucky winners. They will be giving away 10 Ultimate Kitchen makeovers valued at $10,000 as part of their Buy One Get One with mail-in- rebate in-store promotion. I’ve told you what my dream kitchen would look like, what about yours? Over the past 2 months I have been testing out the Finish® suite of products including Quantum, Powerball and Gelpacs. Each morning I load the dishwasher before heading off to school and each evening I empty the clean dishes. The problem, in the past, has been the dishes have not come clean and needed to be rewashed. During my testing period I have not had to rewash a single item using the Finish products, in the end saving my time, money and energy! Check out the Finish Canada Facebook page for more information about winning 1 of 10 $10 000 Bosch Kitchen Makeovers. 1. Purchase any two participating Finish® products. 2. Look in store or download the official refund form. 3. Complete the form and mail it along with your receipt to receive your refund by mail and to be entered into the contest to win one of 10, $10,000 Bosch kitchen makeovers! Just think how wonderful it would feel to have someone call you and tell you, your dream kitchen is on the way. Good luck readers, let me know if one of you wins! Follow along with the conversation on Facebook, Twitter and Pinterest using the hashtag #FinishYourKitchen.